Cute and cool at the lake. 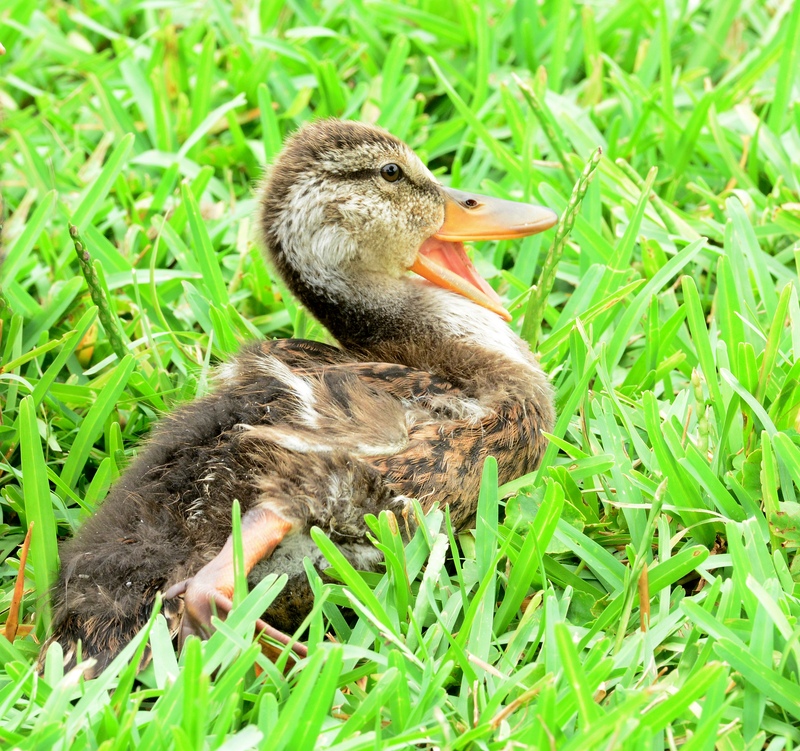 What is it about little ducklings that are so cute??? 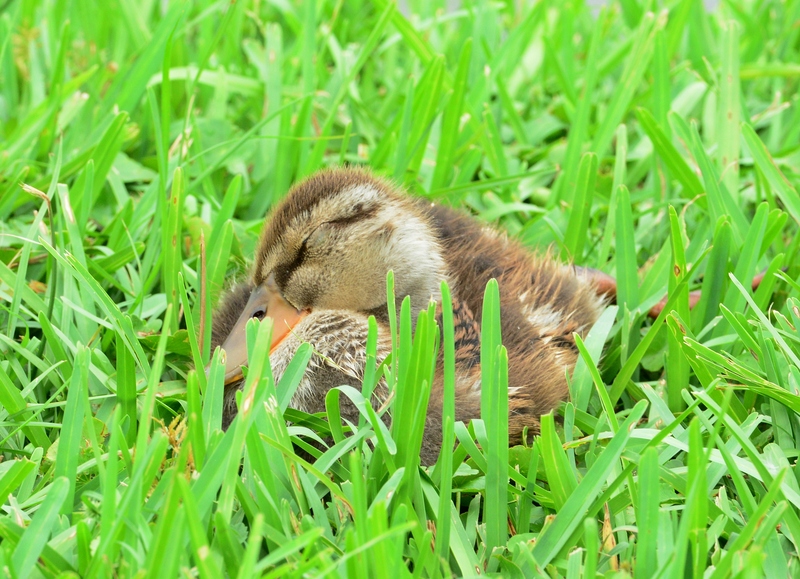 Even hybrid mallards are cute when they are sleeping. 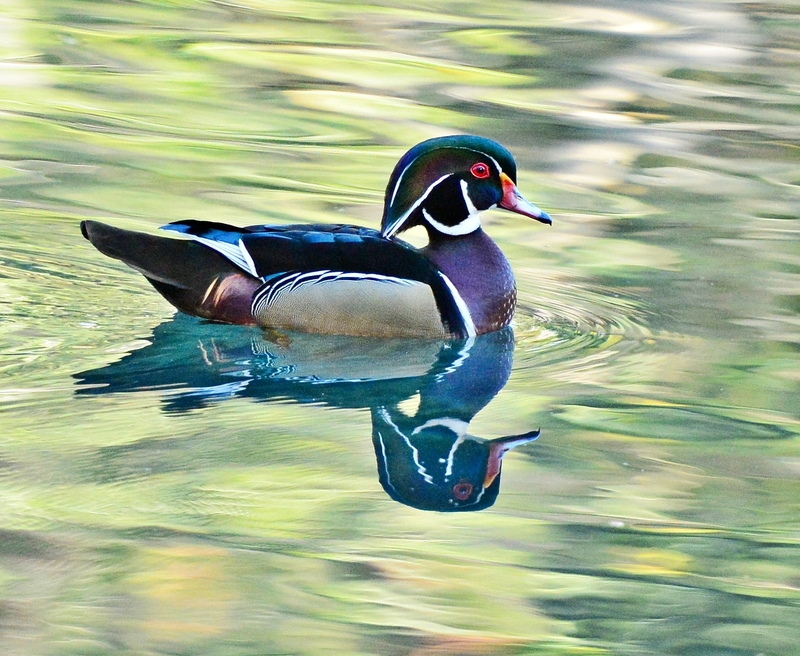 The wood duck is just cool, posing for me. 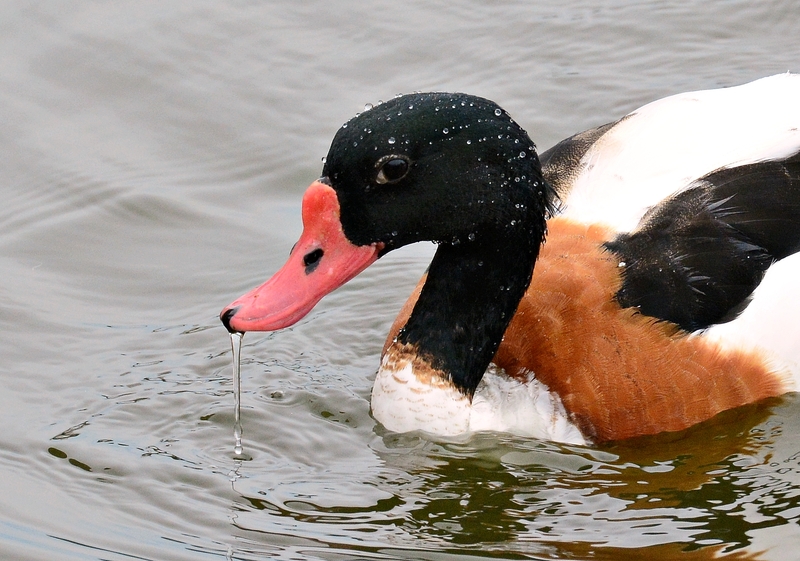 Another cool duck, the shelduck is not native to Florida. The city of Lakeland bought them for the downtown lake. The usual things sleeping and floating around Lake Mirror. 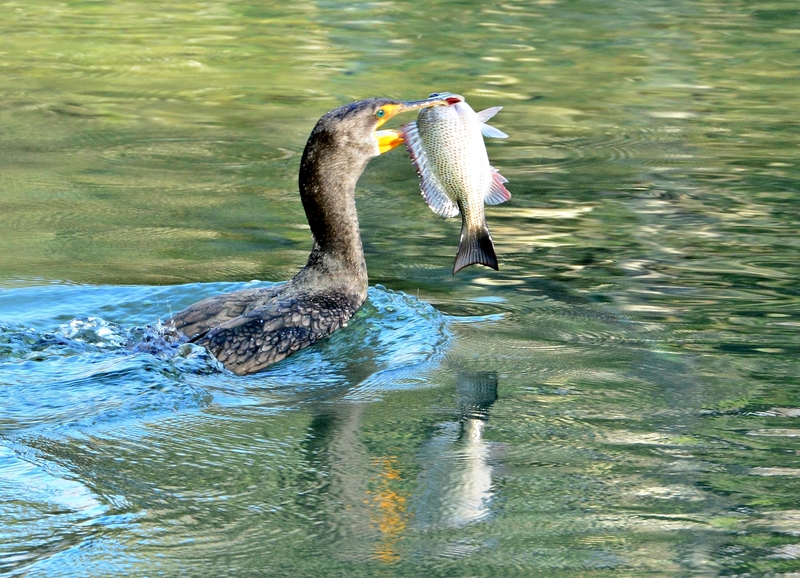 It’s always fun seeing a cormorant trying to gulp down a big fish. 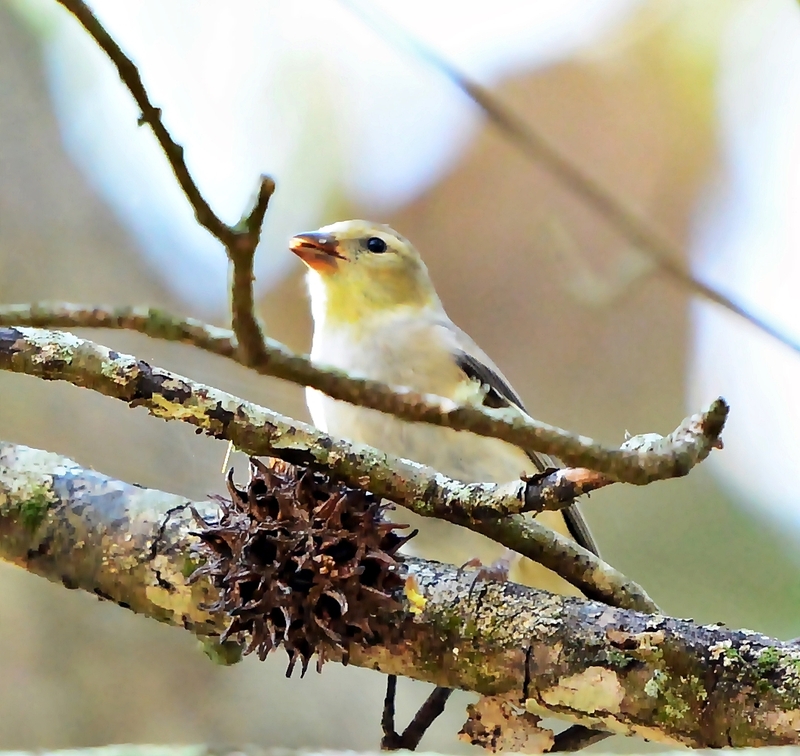 I think this is a male american goldfinch in his winter feathers. He was high up in the trees and didn’t sit still for a minute. I rarely see these here. 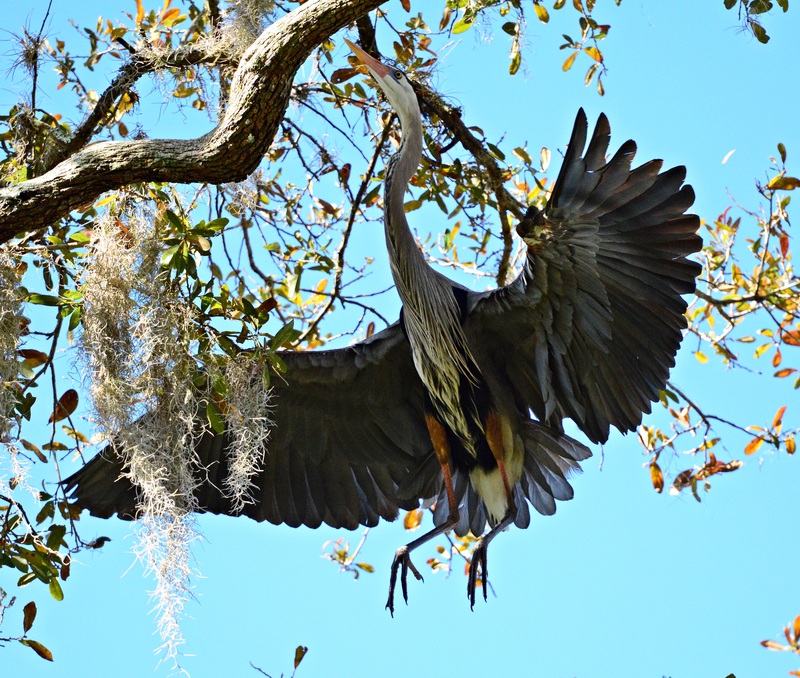 Great blue heron hopping around in the trees. 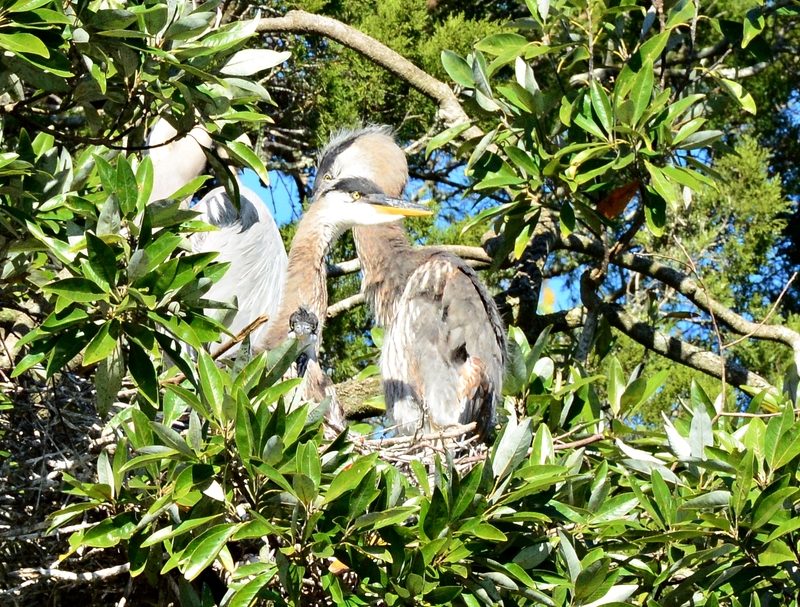 There were a lot of great blue heron nests high up in the trees. It was hard to see up there but this nest had two babies that were almost grown. Most of these birds were not tagged. They might just be hanging out with the permanently injured birds for the winter. 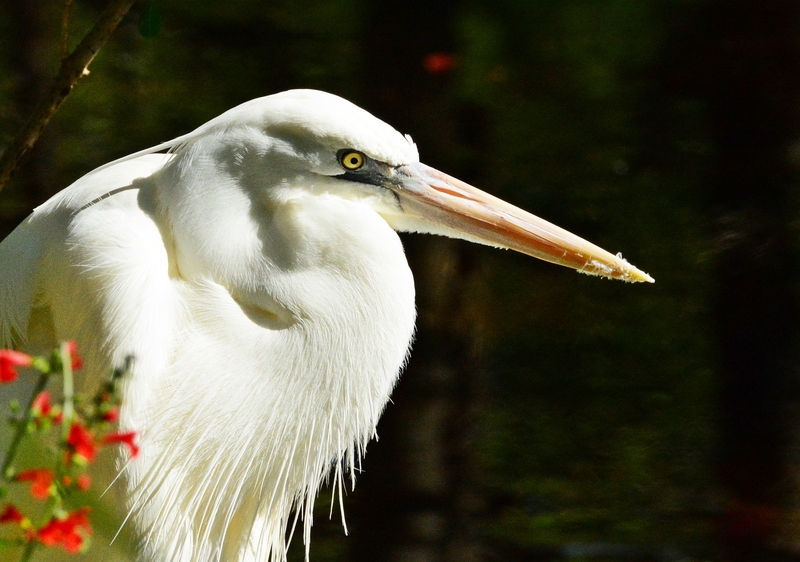 This is a white morph great blue heron. I’ve never seen one here before and this is 2nd time I’ve ever seen one. He wasn’t tagged so I’m not sure if he is just stopping by for a quick visit. 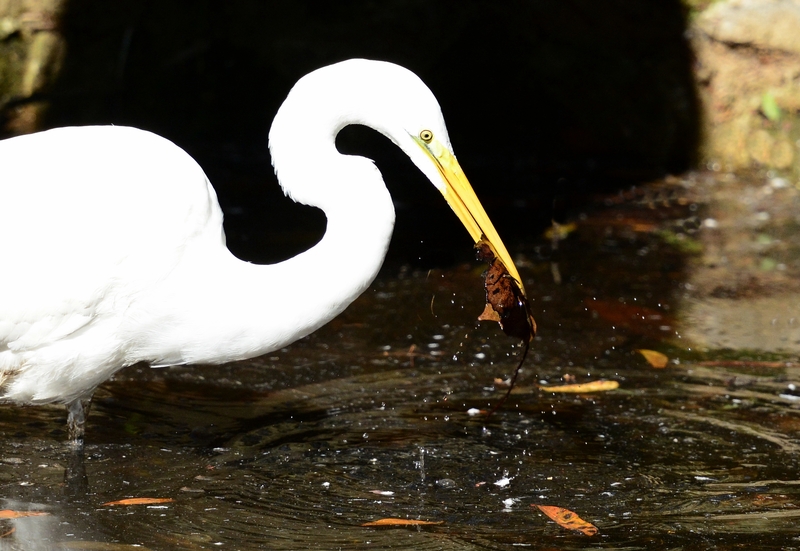 A great egret trying to catch some minnows and coming up with a beak full of leaves. 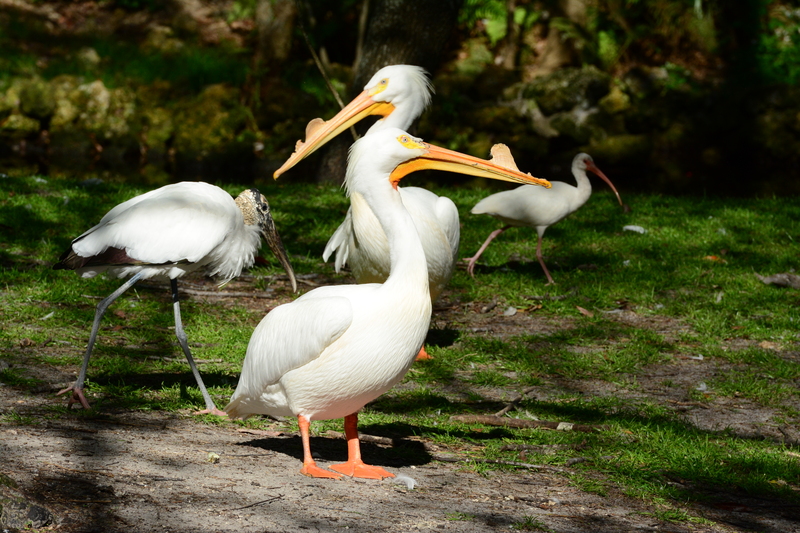 I made my annual trip to Homosassa Springs Wildlife Park in early March. 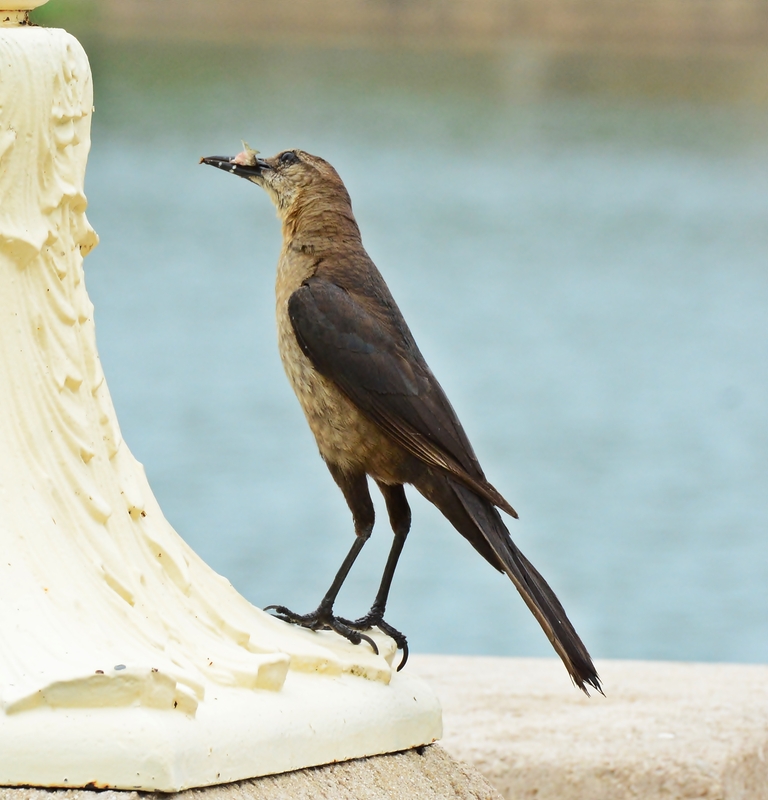 It’s a safe haven for permanently injured birds and other Florida animals. A lot of wild birds and ducks hang out there to get free food. Some come in to nest in the trees over the water. There’s always a lot to take pictures of at the park. 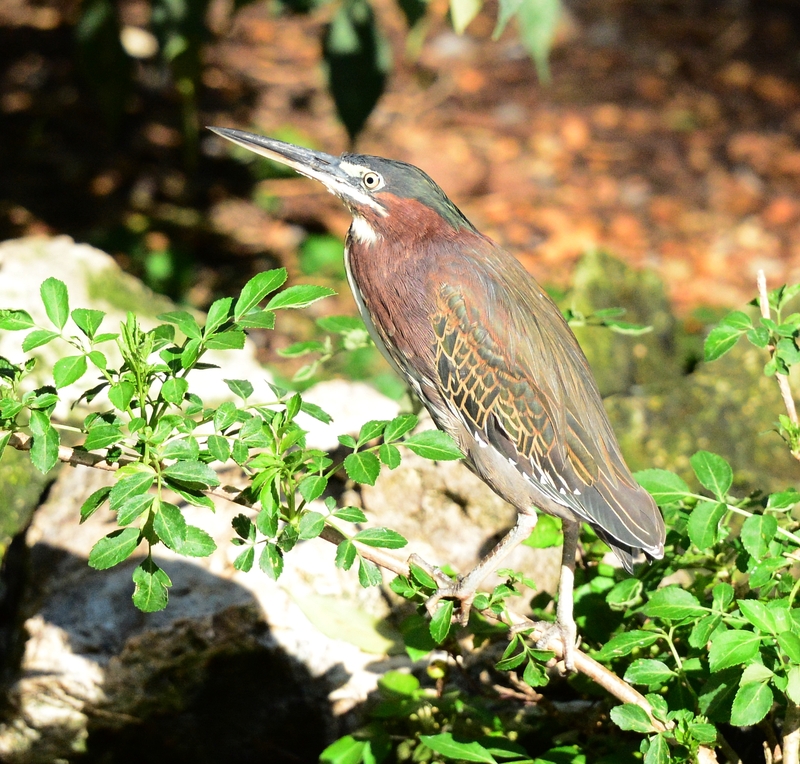 Sometimes in nice not to have to run around in the woods looking for tiny birds high up in the trees. Sometimes it’s nice to just stand in one place and take lots of pictures. This muscovy duck was checking me out. Most of the ducks come pretty close to see if you have food to give them. One of my favorite hybrid ducks at the lake. He’s pretty with the black and white body and yellow beak. One lone white pelican still hanging around the lake. All of his friends have gone north for the summer. He looked okay so I’m not sure why he’s still hanging around. 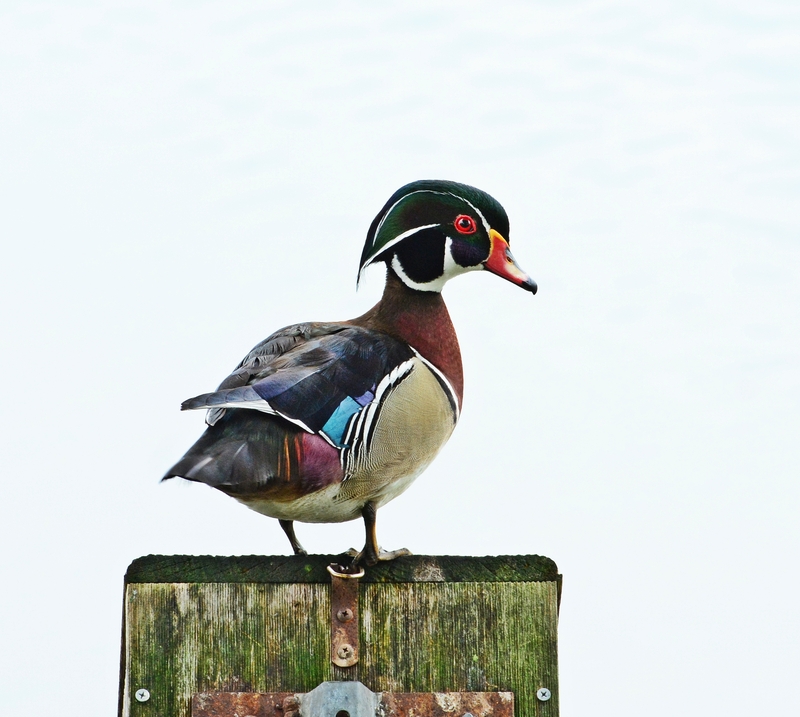 A male wood duck standing on one of the old swan pens along the lake. One of the cottonball heads shaking off. I realized he’s missing an eye. I don’t remember any of them missing an eye before. The other eye was fine. The powder puff male mallard is still there. As I was walking around the lake, I ran into some people feeding the wildlife. They were throwing bread to the birds. At least some people bring dried corn to feed them so it’s not always bad bread. Chaos started as birds from across the lake realized someone had food. They all came over. The storks started grabbing bread. Everyone wants a handout. I guess they get tired of eating bugs and fish all the time. The great blue heron flew in and got a few bites. I left Lake Morton and headed over to Lake Mirror, just 5 minutes away. It was quiet there with only a few ducks close to the shore. I immediately saw this female mandarin duck. Then I found the male mandarin duck on the grass. 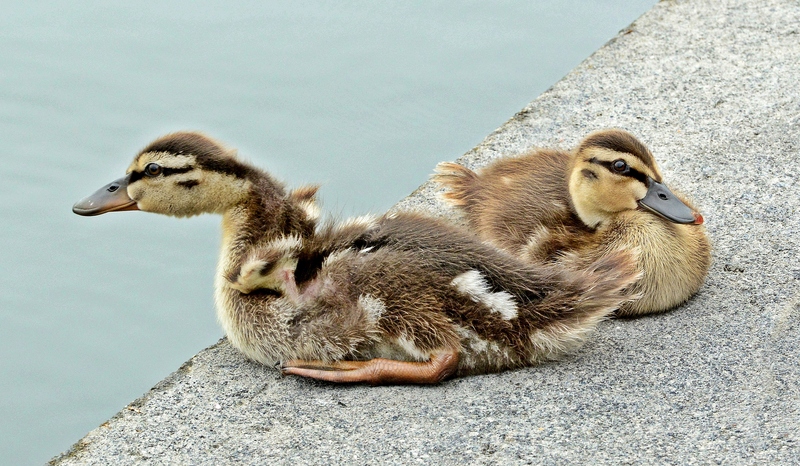 These are not native ducks. The city purchased them because they were pretty and would look good floating around the lake downtown. At first he jumped in the water and headed for his girlfriend. As I sat down on the grass, the male came back up on shore. He seemed curious and headed towards me. He came really close and then headed back into the water. Again, I think he was looking to see if I had food to give him. The couple chilling out along the lake. It rained all weekend in mid-April. I wanted to get over to Lakeland to see if any of the swan eggs had hatched yet. I thought maybe I’d get lucky and the rain would stop. No such luck. It drizzled the entire time I was walking around both lakes. At one point it starting raining heavier and I was walking around with my rain slicker on and trying to juggle an umbrella. By lunch, it was not going to clear up so I headed home. At least I got my walk in that morning. Some type of mallard hybrid. 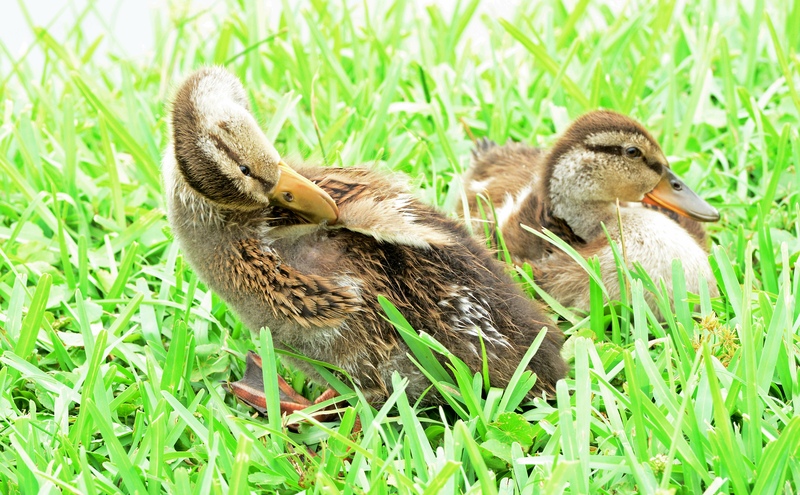 There are so many different ducks at the lakes in downtown Lakeland. They are all one big family now. Another hybrid. This one is unusual looking. Hybrid family sticking close together. I don’t think this is a hybrid but I can’t find it in my Stokes Birding Guide. I’m guessing a juvenile wood duck. Maybe a female one. This one was so cute. She was not skittish at all. 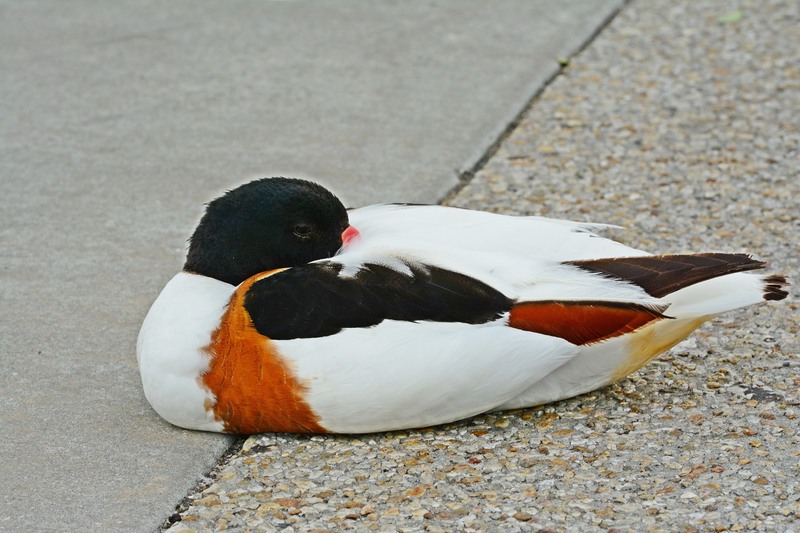 I went looking for the new duck (shelduck) at Lake Mirror in downtown Lakeland last month. While I was there I noticed all the different looking ducks swimming around. 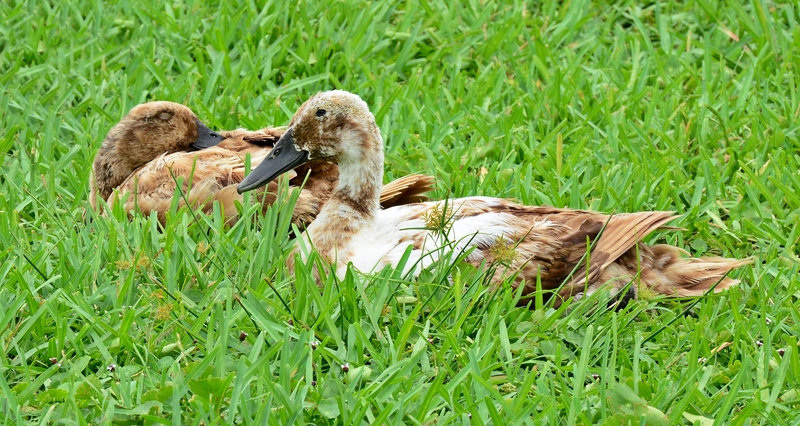 There’s a huge population of mallards, muscovy and white ducks. They all seem to be getting along pretty well. There’s a handful of wood ducks but they always keep to themselves. The other ducks congregate together. People are constantly feeding them so they come close to the edge of the lake. Technically, I think it’s illegal to feed the wildlife including ducks. 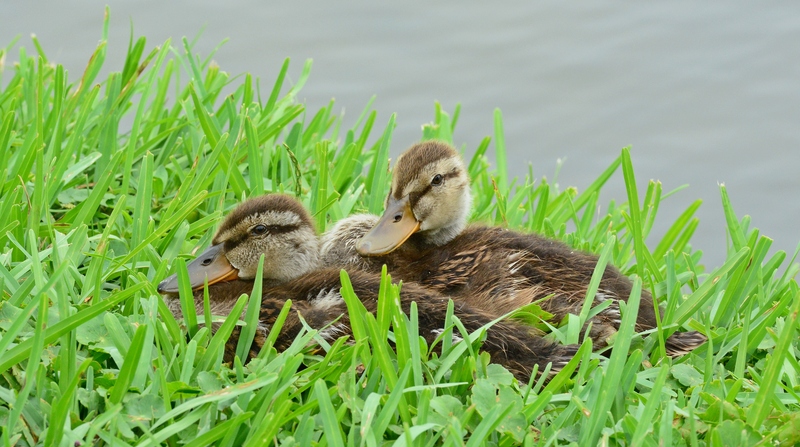 At some of the parks I visit, there are signs saying “Do not feed the wildlife including ducks.” There are no signs at the lakes in downtown Lakeland except for the ones saying not to feed the swans in the pens. They get fed by the city when they have babies. So I’m not sure if it’s different by county. These ducks fill up on snacks such as bread and pretzels, chip, etc. I’m sure that’s not healthy for them. They should be eating bugs. Although, if I was a duck I wouldn’t want to eat bugs either. Wood duck hiding in the shade. Ruddy duck floating around the lake. This guy should have gone north by now. Powder puff head still cruising around the lake looking for handouts. The geese were watching me. Checking to see if I had any food. The magnolias are out in full force. Not sure what this tree is. It looks a bit like forsythia but aren’t those bushes? Another walk around Lake Morton looking for baby animals. 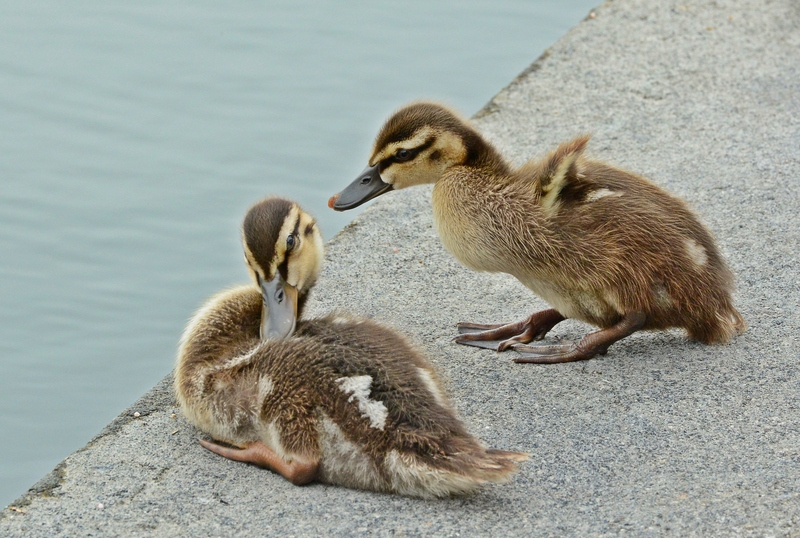 There were plenty of baby ducks but at this time in late April there were still no baby swans. I was finally able to get a swan family though in early May.